The Belfast Lions welcomed Brunswick. 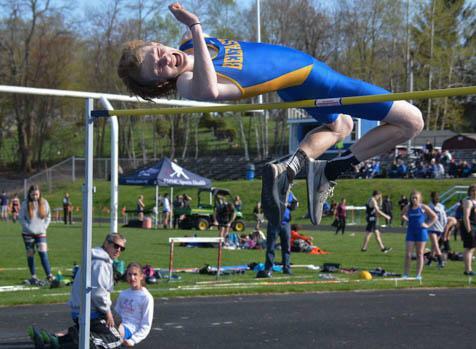 Lawrence, and Gardiner to the edge of Penobscot Bay for a track and field meet on Thursday, May 10th. The Belfast Women, with 97.5 points, claimed a close victory over runner up Lawrence (90.5). Brunswick (60) and Gardiner (30) followed. For the men the Brunswick's depth proved too much for Belfast as the Dragons amassed 117 points to the 97 collected by the Lions. Lawrence was third (62), and Gardiner closed the scoring (4). The individual events were scored to five places, relays to three . The Belfast women accumulated their points by winning the sprints and using their depth at the shorter distances to sweep all three relays. The Lions took first in the 100, Junne Robertson-McIntire (12.96), the 200, McKenzie Banks (29.74), and the 400, Emily Jolliffe (1:03.16). Each of these three also ran in two of Belfasts three winning relay teams. The Lions also got a first place finish from Shera Hilt at the javelin (101-08) and a strong performance from Lillie Mitchell who took second in the long and triple jumps, was part of the winning 4 x 4 team, and also placed in the pole vault. In addition Kelsey Mehuren was in on two winning relays, and claimed second place in the 400. Second place Lawrence was led by Payton Goodwin with first place finishes in the triple (32-06) and long jump. Goodwin also ran third in the 400 and was part of a 4 x 4 team that placed. 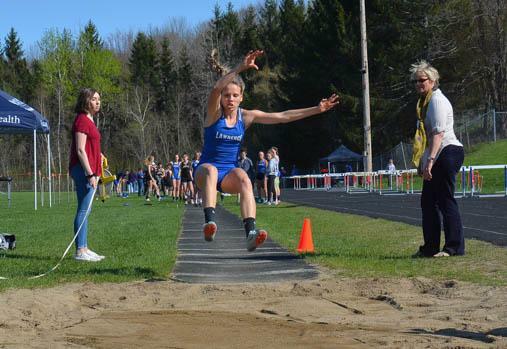 Goodwin's long jump of 16-03.5 represented a new school record at Lawrence. Both jumps are state meet auto qualifiers and new personal marks for Goodwin. Cheyenne Poulin won the 100 Meter hurdles (19.65) for the Bulldogs; she also placed in the pole vault. Ainsley Day claimed the longest discus throw of the day (107-09.5) while setting a new personal mark and qualifying for the state meet. Kristen Jackson won the shot put with a throw of 29-0. Alyssa Bourque placed in the 100, 200, and javelin to help the Bulldogs nail down the second spot. 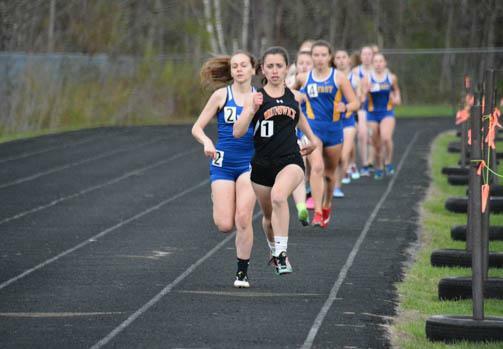 The bright spot for the Brunswick Dragons was Maddie Wayne's first place finish in the 800. Her time of 2:26.93 was a new PR and well under the 2:30 Class A State meet qualifying time. Wayne took third in the triple jump and was part of Brunswick's 4 x 1 and 4 x 4 team, each of which finished second on the day. Brunswick also got firsts from Isabella Pols in the 1600, Haley Kinghorn in the high jump and Tea Kepler in the pole vault. Gardiner got first places from Bianca Tripp in the race-walk, Emmerson Leach in the 3200 and Jaycie Stevens in the 300 meter hurdles. In the men's meet Brunswick swept the sprints, and very nearly swept the distance races too as only Lawrence's Sean Ames win in the 1600 broke the string. Hunter Parker took first place in the 100, 200, and 400 and also managed a third place in the long jump. 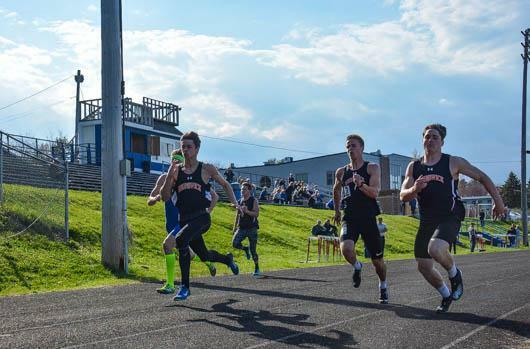 Parker had plenty of company as Brunswick's Owen Richardson followed him across the line in the 100, Jack Harvey in the 200, and Mitchell Lienert in the 400. Brunswick took four of five places in both the 100 and 400 with only Belfast's Ricky Smith keeping the Dragons from sweeping the events. The Dragons did sweep the 3200 as Will Shaughnessy crossed first in 10:04.93; he was followed by Cam Ashby, Tyler Patterson, Andrew Chingos, and Aiden Simmons. Brunswick also took the 800 as Daniel Lyons collected the win there. A slight breeze kept times down in the shorter events but both Parker (53.16) and Lienert (53.51) managed state meet auto qualifiers in the 400. Brunswick's final individual win came in the javelin where Zach Boyle topped the field. The Dragons also collected the 4 X 8 win. Lawrence's Zach Campbell took first in the 100 meter hurdles and was followed by Tucker Boudreau of Gardiner. Boudreau's second place finish in the 100 hurdles represented the Tiger's only points, but the first year just missed in the long jump. His mark of 16-03.25 was just out of scoring range at 6th. Still it was a new personal mark. The 300 hurdles went to Belfast's Luke Blow, one of the Lion's seven individual wins. Donald Resh claimed the top spot in the discus and James Robbins threw the shot put furthest to win. But the big scorer on the day for Belfast was jumper Jack Hansen, a quadruple winner. Hansen went 6-0 to win the high jump, 39-10.5 to take the triple jump, 20-7.5 at the long jump, and ended the afternoon with a pole vault of 11-9. Belfast also won the 4 x 1 and 4 x 4 relays in nailing down the second spot.